What is there to do for Easter in Houston this year? It’s hard to believe that Easter Sunday is almost here! I think you can probably guess that we love Easter here at Amazing Spaces. Just look at the Amazing decorations set out at our beautiful properties! We also love living and operating in Houston, The Woodlands, and Spring communities. 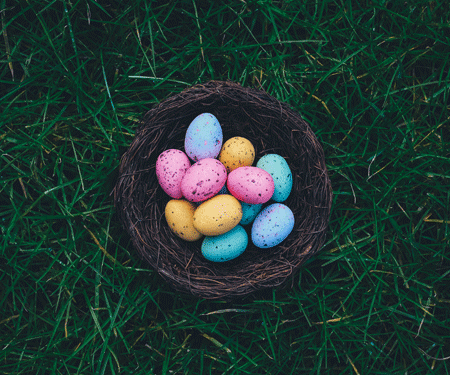 We took a look at each of the neighborhoods where our self-storage properties are located and found the most Amazing things to do this Easter. From a crawfish boil Easter egg hunt extravaganza to eggs with the animals at the Houston Zoo, we guarantee you’ll find something fantastic to do. Easter Fun in Magnolia: Egg Hunt & Easter Feast’ Okay, so this looks Amazing. The whole family can come out to enjoy this event. We’re not sure who Rocky is, but the site describes him as “the Red Chicken Ranch pygmy goat” and he’ll be dressed in something festive. If that doesn’t peak your curiousity, I don’t know what will. There’s also going to be the K-9 Campus Cafe will be ready with a bushel of bunnies for petting (seriously, can you say ADORABLE?!) and they’ll have treats for your puppies! Baby chicks, pony rides, and eggs hidden around the farmer’s market are more of the delights you’ll find here! Easter Fun in The Woodlands: Breakfast with The Bunny at The Woodlands Country Club’ Register for The Woodlands Country Club’s AMAZING breakfast celebration with the Easter Bunny. There will be a train, petting zoo (YES! ), a magic show, and what is sure to be a FABULOUS egg hunt. Remember to bring your baskets! Easter Fun in Conroe: 12th Annual Easter Egg Hunt & Vendor Market Okay, I don’t live near here,but I may have to make the trip up. There is a HUGE Easter celebration at 7 Acre Wood farms. It’s, as they put it, so “Egg..citing”! There will be Easter egg hunting, mini putt putt fun, fun in their western town, zip down the zip-line, play on the playground, and much more FOR FREE! Seriously, it can’t get any better! Easter Fun in Spring: HEB Egg Hunt & Fun’ Our favorite grocery store, HEB is hosting their second annual Easter Egg Hunt for all kids 10 year and younger. This seems like an easy one to squeeze into other fun. There will be coffee for the parents (thank goodness), donuts, orange juice, and gift basket giveaways for the parents!! More Easter Fun in Spring: 7th Annual Crawfish Boil and Easter Egg Hunt So you can’t get more Southern Amazing-ness infused into your Easter – Egg hunt and crawfish boil. Yes, you read that right! The event features a potluck dinner highlighted by hot Cajun Crawfish, games for the youth and the always-entertaining Easter Egg Hunt. Upper Kirby Egg Hunt and Picnic The description on the facebook event page made me laugh: “We have EGGS filled with candy that need finding, and we’ve got a man-sized bunny who can’t wait to photobomb your family pics!” I want to go just to meet the man-sized bunny. There will be fun for all at The Story’s Community Easter Egg Hunt on Saturday, April 15 from 10am-noon. There will be food trucks (!!! ), games, activities, and photos with the Easter Bunny (naturally). Make sure to bring your picnic blankets and Easter baskets! Houston Zoo Animal Egg Hunt This may a winner for my hubby and me. Easter + Zoo Animals. Just look at how much that gorilla likes his eggs! The animals have their very own egg hunt! How Amazing is that!? The gorillas, meerkats, and even the elephants are receiving their own egg-themed enrichment throughout the day. I want to go! Carol Fox Park Egg Hunt If you’re one of our West Rd clients, you may be interested in the annual Carol Fox Park Egg Hunt. This one was a little challenging to find information on, but we did find pieces of it mentioned in different areas. Hunt for eggs with traditional Easter treats and special eggs containing coupons for prizes. First hunt for ages 0-3 starts at 2PM in the sand volleyball area. A hunt for ages 4-9 will start immediately following. The last hunt for ages 10 and up will follow the hunt ages 4-9. Children must be supervised by parents! Easter in The Gardens at Moody Gardens This is a free and fun event for all people! Egg hunts, petting zoo fun, and visiting the Easter bunny can all be found at the Easter in The Gardens event at Moody Gardens. There’s prizes and buffet feast all weekend long! Easter Brunch and Munch We love this guide about the best places to go for brunch on Easter Sunday. The Dunlavy looks absolutely beautiful, but the food at Rainbow Lodge looks like a feast fit for a king! Enjoy! What are your plans? Leave a comment below!